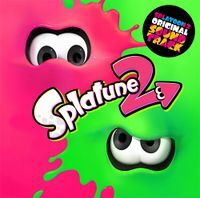 Splatune 2 is the first original soundtrack for Splatoon 2, and serves as a sequel to the first Splatune. It features two discs with 82 tracks total of in-game music and sound effects. Also included are album cover art of the various bands featured in the game, lyrics to the music by Off the Hook and interviews with Wet Floor and Marina. The first production run also came with a Splatoon-themed guitar pick. It was released in Japan on 29 November 2017. It was later accompanied by Octotune. Songs by Wet Floor and Off the Hook have louder vocals than their in-game versions. Inkoming! sounds different when it starts to loop. It has a proper ending as well, as opposed to fading out. The synth solo in Endolphin Surge is changed. The reverb effect on the trumpet in Broken Coral is removed. Inkopolis Square starts with the main speaker music before fading into the background to play the jingles that play from other speakers in the Square, and then fading back in before the song finally fades out. Dubble Bath (DIY Remix) has brief moments where the sound is distorted as if a control stick was quickly tilted while in a lobby. The sound clips that only play if the Control Pad is pressed are also present. Inkopolis News has a section where Marina's record scratches play, and then ends properly. Octo Canyon contains all five versions that play depending on which zone the player is in. Octarmaments contains all three versions that coincide with the three phases of each boss. Bomb Rush Blush does not fade out, but instead transitions to Tidal Rush, as what happens in-game. Tidal Rush starts with the beat that plays after completing the second phase of the final boss. From the booklet included with Splatune 2. They are all nonsensical; the Japanese hiragana and katakana simply give the pronunciation. Also included in the booklet are fictional interviews of some of the "artists" who worked on the in-game music. This is the first album in the Splatoon series to not have a bonus track. Unlike previous albums with music featured on previews, the version of "Inkoming!" from the Nintendo Switch Presentation 2017 trailer still contains sound effects. Lyric sheet for Color Pulse, Ebb & Flow, Acid Hues, and Muck Warfare. Off the Hook cover art. New You single cover art, by DJ Real Sole. Notes from composers Toru Minegishi, Ryo Nagamatsu, and Shiho Fujii. This page was last edited on 13 April 2019, at 08:00. This page has been accessed 38,598 times.